Individual political donors from Iowa have pumped more than $43 million into political races the past three years, but knowing the impact of those donations may be hard to determine. The reason: the growth of anonymous donors and Super PACs. This is true even for the top 10 political donors in Iowa in the last two election cycles, from 2011 through June 30 this year, political experts said. “These individual donations are being lost in the shuffle a little bit,” Christopher Larimer, professor of political science at the University of Northern Iowa, said. Larimer said pinpointing individuals’ influences on the political process would require examining what candidates think deep down about connecting donations to influence on an issue. But individual donations are starting to move to the wayside while large anonymous contributions grow in importance, he said. 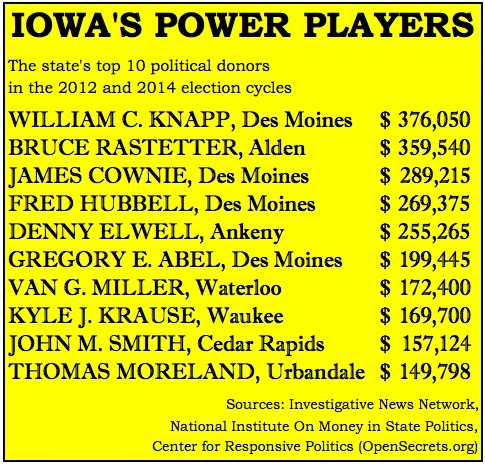 Democrat William C. Knapp, owner of Knapp properties in Des Moines, tops the list of Iowa’s 10 leading donors from 2011 through June 30, contributing $376,050, according to data compiled and analyzed by the Investigative News Network for IowaWatch. 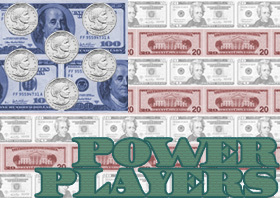 Data were provided by the National Institute on Money in State Politics and the Center for Responsive Politics. It covered this general election cycle and the previous one. Knapp said he donates because he agrees with Democratic Party beliefs, although he has donated to some Republicans who include Gov. Terry Branstad. “I think a lot of times, you lead by example and so I’m not trying to impress anyone,” Knapp said. Knapp said he hopes his actions encourage other people to engage financially in politics. Seven of Iowa’s top 10 political donors gave exclusively to Republicans. They include Iowa Board of Regents President Bruce Rastetter, an Alden area farmer and business owner who was the top Republican donor doling out $359,540.32 during the two election cycles analyzed. 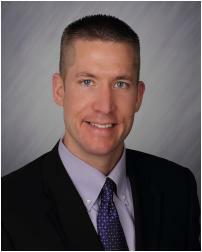 As you would expect, Rastetter has contributed to the GOP campaigns of Branstad and Lt. Gov. Kim Reynolds, U.S. Senate candidate Joni Ernst, Republican congressional candidates, Iowa House Speaker Kraig Paulsen and others; as well as to funds such as the National Republican Senatorial Committee. 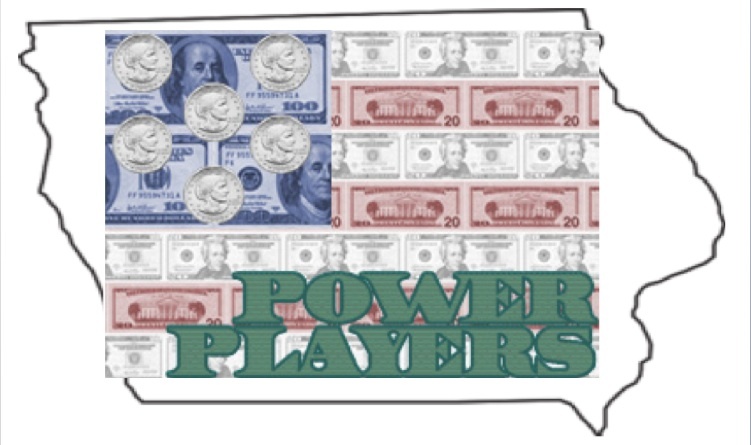 Other Republicans on the top 10 donor list include James Cownie of Des Moines, owner of JSC Properties, at $289,215; Denny Elwell of Ankeny, owner of Denny Elwell Co., at $255,265; and Gregory Abel of Des Moines, president and CEO of MidAmerican Energy, at $199,445, the analysis showed. THIS STORY IS PART OF AN INVESTIGATIVE NEWS NETWORK COLLABORATION EXAMINING THE MAJOR POLITICAL DONORS IN STATES ACROSS THE UNITED STATES. TO VIEW OTHER STATES IN THIS INITIATIVE, PLEASE VISIT WWW.INVESTIGATIVENEWSNETWORK.ORG/. IOWAWATCH IS PART OF THE INVESTIGATIVE NEWS NETWORK. They are followed by fellow Republican-leaning Kyle Krause of Waukee, chief executive officer of Kum & Go, at $169,700; John M. Smith of Cedar Rapids, board chairman at CRST International Inc. board chairman, at $157,124.15; and Thomas Moreland of Urbandale, chief executive officer at St. Jude Healthcare, at $149,798. Half of the top 10 political donors gave their largest donations to Branstad and Reynolds, with Rastetter topping that at $80,640.32. Another Democrat on the list is Fred Hubbell of Des Moines, a retired businessman, at $269,375 in these past two election cycles. Van G. Miller of Waterloo, owner of the VGM Group, has given a total of $172,400 to candidates from both of the major political parties, the election data analysis shows. Michael Brickman, the Iowa Republican Party’s communications director, said Republicans in the state like to donate because it’s a method of free speech. Brickman said most of the state party’s donations come from small, individual gifts ranging from $50 to as low as $10. He acknowledged that people are funneling in money from outside of the state, something getting a lot of attention in several hotly contested campaigns setting the stage for the 2016 precinct caucus season, but said it’s not commonplace. However, millions have been spent from outside of the state on both Republican and Democratic candidates in Iowa, a swing state in several recent national elections. American Crossroads, a Republican Super PAC, had contributed $1,175,753 to Ernst’s race for the Senate seat going into November, while Democratic U.S. Rep. Bruce Braley had received $714,327 from the Super PAC NextGen Climate, according to OpenSecrets.org/. Larimer said people who donate large amounts of money get opportunities to meet with their representatives and push issues that matter to those donors. “Lawmakers have limited attention, limited time, but if these folks are getting better access, then they’re getting more face time with these lawmakers. And that could potentially sway their opinion one way or another,” Larimer said. However, Larimer said determining how the biases of those giving to Super PACs and anonymous funding organizations influence elected representatives is difficult because the public does not know who is making the donations. Brickman said he prefers to view campaign donations in a less cynical way. He said people contribute money to support a candidate’s beliefs, rather than to influence a candidate to take a new position or change a point of view. Knapp added another reason to give: he said he does not want to be in politicians’ shoes. Attempts to interview Iowa’s nine other top political donors were unsuccessful. The Courier (Waterloo-Cedar Falls, IA), Council Bluffs Nonpareil and The Hawk Eye (Burlington, IA) published this report under IowaWatch’s mission of making its stories available for republication. Please support our nonprofit journalism with a tax deductible donation at this link. Iowans with deep pockets when it comes to making campaign donations are sending some of their money out of state, even to places where their contributions may seem like a drop in the bucket.